Horror games have been a cult-favourite genre for many decades now, going as far as back as the 1980s with the Atari title Haunted House, but it wasn’t until the late 90s to early 2000s when it reached the ‘Golden Age’ that included such classics as Resident Evil, Silent Hill and Clock Tower. Nowadays, the genre has mostly disappeared from the mainstream console market with major publishers having decided to invest in games that allow for bigger sales and easily placed microtransactions. However, horror games continue to live on in the indie game scene, especially on PC with Steam and RPG Maker giving rise to unusual and unique horror experiences from the likes of Slender Man to Five Nights at Freddy’s, combined with Youtubers streaming their gameplay and reactions, giving each game their rise in prominence. Among these indie horror titles includes a 2012 game called The Witch’s House, a freeware puzzle-horror game developed by a single person by the name of Fummy. Its original release gathered a lot of attention via word of mouth and streamers, with the game remade last year as The Witch’s House MV. The original creator also released a prequel novel in Japan that eventually got adapted into a manga series. This book is the first volume of said manga adaptation, available for the first time in English. Due to the nature of this book, it contains major spoilers for the story of the original game. If you’re interested in the title, I highly recommend playing it first. If you’re not a gamer but are interested in knowing the story regardless, there’s lot of Let’s Plays to check out, and I personally recommend this little review video that fully explores the gameplay and story. From the opening pages, the tone is set very well by showing Ellen’s horrific actions we know from the game and then quickly flashes back to where it all began for her. On the surface, the book relies heavily on a lot of angst and shock that the character has to endure which may seem a bit too forced from an outsider’s perspective, however the build-up from Ellen’s more innocent starting point to the horrifying twist is well handled. The art brilliantly conveys that something is very wrong with the family that involves a lot of reading in-between the lines of dialogue, from the mother having a dead look in her eyes even when tending to her sick child, to the subtle build-up that Ellen is no saint either. The first chapter, which fully captures her family life and tragedy, is the longest and therefore the best paced of the book, with plenty of gory imagery to enjoy as well, like a ticking time bomb, you know is going to go off sooner or later but can’t look away from. The rest of the book takes place in the titular house, as we see how Ellen develops from naïve witch to full-blown murderer towards the last pages. Fans of the game will likely enjoy these chapters the most, as there’s plenty of references to it, both visually and verbally, translating the horror that lurked in that house brilliantly into these pages. These chapters don’t have as much non-verbal communication to pick up on as the opening chapter does, but we do get to see the different layers of Ellen. At the start she does not know how to read or what ‘being loved’ truly is, and seeing her struggle and attempting to improve herself as she lives inside the magical house is a contrast against a backdrop of darkness that we know is to come. It’s interesting to see the villain, as we know her, has come into her own, especially when her relationship with the cat goes from doting helper to being literally her only companion towards the end. It’s clear that the translator, Caleb Book, has played the original game as the translator carefully makes sure that the lines lifted from the game (for example the diary entries) are word-for-word accurate. There are no translator notes, which would’ve been nice to have maybe to help explain a few game-based plot points that non-players could follow, but the story is so simple that it’s not really necessary. The art is provided by Yuna Kagesaki, who’s best known for her manga series Chibi Vampire; although both have a bit of gore in, The Witch’s House is far darker in tone and the art style really conveys that with lots of black shading, creepy close-ups and unsettling panels that capture the death scenes that eerily look very similar to what we see in the game. The opening colour pages are a nice touch as well. This prequel to the horror indie game is a gruesomely delightful book with a simple but effective story, dark imagery and strong lead character. 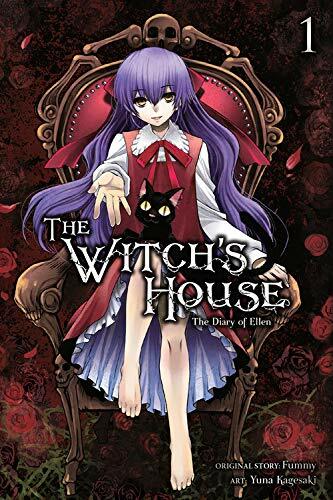 The Witch’s House: The Diary of Ellen is best enjoyed when accompanied by knowledge of the game however, so if you’ve yet to dive into it, there’s no time like the present.